While Apple rolls out iOS updates rapidly to its iOS devices three years after their release, Android phones often ship with outdated software that is rarely updated, even during the device's original contract term. A report by blogger Michael Degusta of the the Understatement graphically recounts how it is that 45 percent of Google's installed base of active Android users is still stuck using software released in the middle of last year: vendors are simply refusing to make updates available for their phones. Degusta contrasted iPhones introduced by Apple and the last three years of US Android phones. While all iPhone models have received the latest iOS updates for at least three years following their introduction, only three Android models have been kept relatively up to date for more than a year, and none of them appear eligible to receive the latest Android 4.0 Google just announced. Google's own Nexus One has received the best support, but the company just announced that it won't be getting the new Android 4.0 "Ice Cream Sandwich," even though it's not yet two years old. Two other popular Android phones, Verizon's Motorola Droid and Sprint's HTC Evo 4G, have received sporadic updates but are similarly unlikely to get the new software. The original Droid had already fallen a year behind in major Android updates this summer. Other Android models fared far worse, with 7 of the 18 models never shipping with nor ever being updated to the current version of Android, and 5 more only ever ran the current version for a few weeks during their lifetime. Google's previous release for smartphones, Android 2.3 Gingerbread, was first made available in December 2010, but 15 of the 18 models still can't run it nearly a year later. Even makers that promised to release updates have left their buyers stranded. "The Samsung Behold II on T-Mobile was the most expensive Android phone ever and Samsung promoted that it would get a major update to [Android 2.1] Eclair at least," Degusta noted. "But at launch the phone was already two major versions behind  and then Samsung decided not to do the update after all, and it fell three major OS versions behind. Every one ever sold is still under contract today." Similarly, Verizon's Motorola Devour received reviews saying it was 'built to last and it delivers on features.' As it turned out, the Devour shipped with an OS that was already outdated," Degusta stated. In a year, "it was three major versions behind. Every one ever sold is still under contract until sometime next year." Being stuck with outdated software is a problem for users not just because they're missing features and refinements but also because of security updates. It also hurts app development, because the fragmentation of Android forces developers to "end up targeting an ancient version of the OS in order to maximize market reach," Degusta explains. "iOS developers, like Instapapers Marco Arment, waited patiently until just this month to raise their apps minimum requirement to the 11 month old iOS 4.2.1," Degusta wrote. "They can do so knowing that its been well over 3 years since anyone bought an iPhone that couldnt run that OS. If developers apply that same standard to Android, it will be at least 2015 before they can start requiring 2010s Gingerbread OS." As to why its such a problem for Android makers to keep their phones up to date, Degusta notes that part of the problem is that Android has to navigate through individual phone makers and carriers, while Apple's iOS updates pass directly to its customers. Additionally, neither the carrier nor the phone makers seem interested in keeping their customers happy. "Apples way of getting you to buy a new phone is to make you really happy with your current one, whereas apparently Android phone makers think they can get you to buy a new phone by making you really unhappy with your current one," Degusta said. 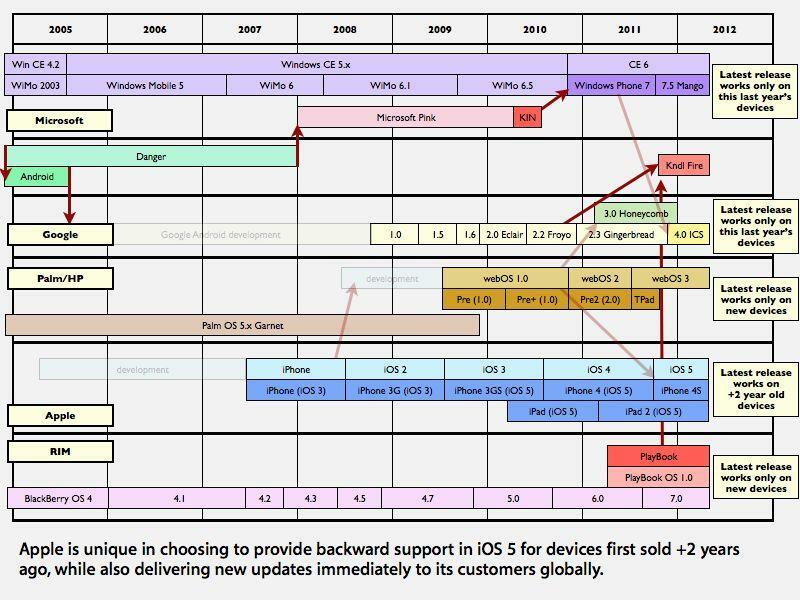 While Degusta is profiling the lack of major releases (noting that most Android phones are a year or two behind), Apple also keeps its iOS customers up to date with many updates throughout the year, ranging from 6 to 10 free minor updates annually that address bugs, add features or provide other enhancements. 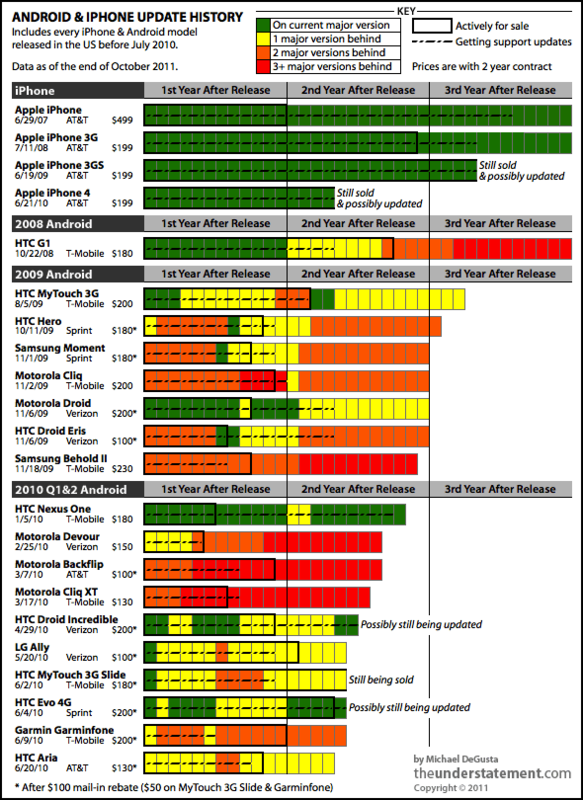 Android isn't alone in providing a poor record of updates for phones still under contract. HP terminated support for the Pre Plus generation of phones in webOS 2.0 when they were barely 18 months old, while Microsoft killed off all updates for its Windows Mobile users (and app developers) last winter at the release of Windows Phone 7. RIM similarly released BlackBerry 7.0 only for new phones this summer. Since then, webOS, WP7 and BlackBerry OS updates have trickled out through carriers at a glacial pace, with Microsoft issuing two feature updates and two minor fixes in the last year that are scheduled and deployed on an individual carrier and model basis.